A sixth-plate tintype image of a Yankee cavalry man in a sitting pose. The editor of Military Images answers the frequent concern that the magazine does not include enough articles on the Confederacy. The editor reminds readers that the content of the publication comes from the readership, and that someone needs to write the articles with Confederate content to have it included. The author of the cover article on the 9th Infantry and Colonel Liscum received a response from General Matthew B. Ridgway, providing further context on the history of the unit and the regard for which Liscum was held. Another helpful letter came from Rene Chartrand of Parks Canada and provided correction and context for a few images for which he held expertise. In a twist of fate between “honorable opponents” in October 1864, the competition between the “Old Ringgold” of the Union and McNeill’s Rangers of the Confederacy led to the Rangers intervening on behalf of one of their opponents against John S. Mosby’s Rangers. After being ordered to destroy a still in “Mosby’s Confederacy,” the men of the Ringgold Cavalry apprehended a Baptist minister who was one of Mosby’s men. Their commander, General Averell, ordered a court martial and hung the man, leaving his body to dangle at the side of the road. A while later, Pvt. White realized he had forgotten his saber and rode back, only to be captured by Mosby’s men and also sentenced to hang. Some of McNeill’s men were able to convince Mosby that White had nothing to do with the minister’s hanging, leaving White to be transferred eventually to Andersonville and to survive the war. It began with a conflict between the Paiute Indians who were looking for some kidnapped girls and the inhabitants of a Pony Express station northeast of Virginia City. One man got away, and there was a demand for retribution from the residents there. A small informal detachment of miners, rogues, and militia eventually found the Paiutes, which killed the leader, Major William M. Ormsby and several others at the Battle of Pyramid Lake. A few stragglers made it back to Virginia City, and when the word reached California about the incident, General N.S. Clark, Commander of the Department of the Pacific, organized what became known as the Carson Valley Expedition. Eventually catching up with the Paiutes at Pinnacle Mount, the expedition was able to defeat them. Christopher M. Calkins’ monograph Thirty-six Hours Before Appomattox covers the lesser-known fighting at places like Sayler’s Creek, High Bridge, Farmville, and Cumberland Church, providing a wealth of information about these battles to include personal anecdotes, maps, photographs, bibliographic references, and other accumulated evidence. The article discusses the achievements of four Medal of Honor recipients, all of them aviators from World War I, including images of the men in France. Lt. Frank Luke was a leading American ace with a confirmed 18 victories (14 balloons, 4 aircraft) when he went missing near Verdun. His grave was located after the Armistice, with French locals telling the story of how Luke was killed while firing into a group of Germans who had surrounded his landed aircraft. Eddie Rickenbacker had been a race car driver, and had been assigned to the U.S. flying school at Issoudun due to his knowledge of gasoline powered engines. He learned to fly and by the end of the war, he had earned the most victories, with a total of 26 confirmed. Lt. Rickenbacker earned his Medal of Honor for attacking seven German aircraft on his own, downing two of them in September 1918. The last two recipients, Lt. Harold Geottler and Lt. Erwin Bleckley, were killed together as they searched for the “Lost Battalion” in the Argonne. They were charged with dropping supplies to the men on the ground, which were hard to spot visually. Geottler was flying the aircraft, while Bleckley had the role (as indicated by the half wing insignia on his uniform) of making observations. Geottler was shot by anti-aircraft fire and the plane dove and crashed, throwing Bleckley from the craft to die later from internal injury. 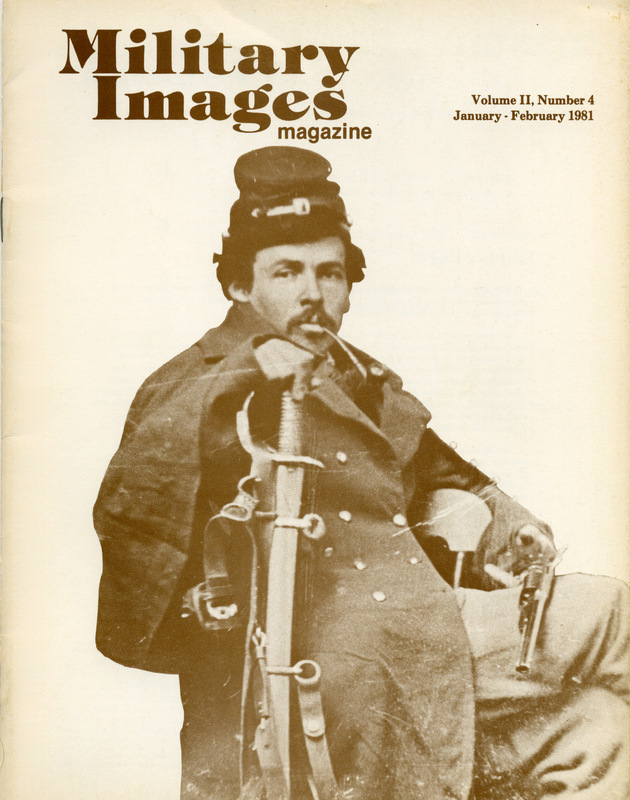 The article follows the newly formed unit as it gathered in early 1864 and prepared for war as a mounted rifle unit. Although without horses for their first seven months in the field, the Guard was on duty during the Battle of the Crater at Petersburg and took part in the expedition to destroy the Weldon Railroad. They were given mounts in November 1864 and fought until they ran out of ammunition during the Battle of Dinwiddie Court House. The last man from the unit killed in action fell at Clover Hill, less than two hours before the nearby cease-fire at Appomattox Court House. Descriptions of how the frock coat was worn by Federal soldiers of the Civil War are given, accompanied by seventeen different carte de visite images that illustrate each point made in the article. Examples of many variations, especially with those soldiers who were musicians, show how the frock was worn. The reader can see how buttons and double- or single-breasted frocks denoted rank, as well as how a brevet rank can be distinguished. Large images of these Civil War veterans from Cincinnati, Ohio allow the reader to see how they began as Company B of the Cincinnati Zouaves Independent Militia in 1868. When the other four companies disbanded in 1872, they were renamed “The Lytle Greys” in honor of Cincinnati native General William Lytle who fell at Chickamauga in 1863. They saw active service in the Nelsonville Coal Riot of 1874. Known as a particularly successful competition until 1877 when military law was changed in Ohio, they then were integrated into Company B, First Infantry Regiment of the Ohio National Guard. The article provides detail on their uniforms, which changed three times between 1868 and 1877. Part I of this article discusses the way new technology can utilize the unique qualities of the original ambrotype. These were one-of-a-kind images produced on glass, usually as a negative, and then coated or backed to create a positive or “corrected” image. These old images can be teamed with an enlarger to provide detailed prints due to their incredibly clear nature. The sixth-plate image provided by the article has gone through this process, and a detailed image, enlarged more than 60 times the original, reveals the seal of the state of Vermont on one of the buttons. Part II of this investigation of the ambrotype considers what might be found not in the image, but behind the image. Taking two ambrotypes out of their protective cases in order to clean the protective glass, the author of this part found what appears to be hidden messages. Two were found behind the ninth-plate ambrotype taken of Oliver Hazard Perry, Jr. in approximately 1863. Quite cryptic and in one instance very small, the meaning of these little pieces of paper remains a mystery. The other ambrotype yielded a different kind of mystery. The artist found a paper “heart-in-hand” cut out behind a sixth-plate ambrotype of a Maryland trooper, measuring about 2-1/2” in length. With a paper heart woven into the wrist area of the hand, the silhouetted hand held the message “friendship, love, and truth I give to you my heart and hand.” The signature had been scratched out, making it unclear if the ambrotype had been a gift to a young lady, or if the paper cutting had been a gift to the young soldier. A variety of images complete this issue of Military Images, from a 1936 U.S. Army vessel (a minelayer) in the Philippines, to a vignette on a carte de visite showing Federal soldiers preparing their mess. Two unique cartes de visite stand out as well. One is of Edwin H. Stoughton as a colonel of the 4th Vermont Infantry, well before his infamous capture from his bedroom in Fairfax Court House with the rank of brigadier by John Mosby in March 1863. The other is of Major Harvey B. VanVohis of the 18th Pennsylvania Cavalry Regiment, with whiskers that rival those of General Ambrose Burnside, who was featured on page 16. An additional pair of images were of note, with one of an ambrotype in need of restoration to reverse peeling and the other consisting of a black-and-white photograph on oiled paper backed with a colored drawing of the subject, “giving it the effect of a color photograph.” An appeal for information about both of these last images was made. A cabinet photograph of Private Harry J. Martin of the Nevada Volunteers taken at Camp Clark in Carson City, 1898.